A new glass frog species with transparent skin through which its beating heart is visible has been discovered by scientists who warn that the amphibian may already be at threat of extinction. The frog (Hyalinobatrachium yaku), discovered in the Amazonian lowlands of Ecuador has unique physical and behavioural traits. The dark green spots on its back and its reproductive behaviour mark it out as different from known frogs. "Males guard the eggs, which are attached below a tree's leaves, until they hatch and fall on the below water stream," said Juan Guayasamin, of the Universidad San Francisco de Quito in Ecuador. 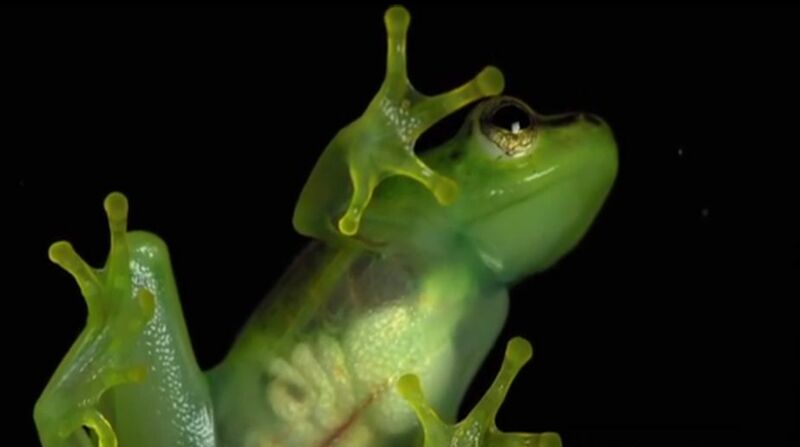 "Not all glass frogs have hearts that are visible through the chest. In some, the heart itself is white, so you don't see the red blood," said Paul Hamilton, of US-based organisation Biodiversity Group. "Amphibians are the most threatened vertebrate class on the planet," Ariadne Angulo of the amphibian specialist group at the International Union for Conservation of Nature, was quoted as saying by 'New Scientist'. Glass frogs need pristine streams to breed in, researchers said. "If the stream dries up, or becomes polluted, the frogs can't survive, and other more resilient creatures may be next," said Hamilton. "We don't yet know enough about the new species to establish whether it is would be officially deemed as threatened," he said. "We do know, however, that its habitat is rapidly disappearing. Oil production has expanded greatly in this species range and road building is rampant," he added.